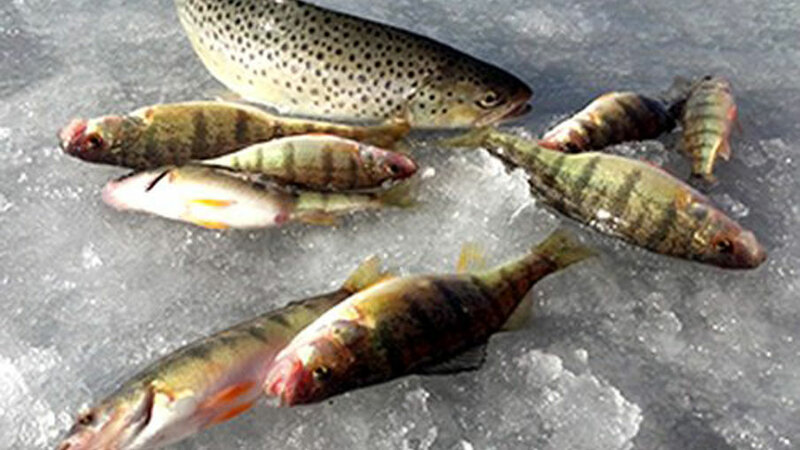 This is first in a four-part series about a fun activity to do in Utah in the winter — ice fishing! Don't put your fishing gear away yet. If you do, you might miss some of the best fishing of the year. That's right — those "crazy" people you see standing on the ice at waters across Utah aren't so crazy after all. They know a layer of cold ice means hot fishing in the water under the ice. "You can set your watch by it," says Drew Cushing, warm water sport fisheries coordinator for the Division of Wildlife Resources. "When ice starts to form, the fish under the ice get very active. And they're eager to bite." Luckily for anglers, the eagerness the fish have to bite often continues through the winter. You can stay updated on where fishing is best in Utah this winter at wildlife.utah.gov/hotspots. Get the most up-to-date ice conditions by following us on Twitter. If you're willing to walk, you can reach any part of the lake or reservoir you want to fish. Cushing calls ice "the great equalizer." "In the winter," he says, "you don't need a boat or a float tube to reach certain parts of a body of water. If you have a rod and a reel, and you're willing to walk, you can reach any part of the water you want to fish." Catching fish in the winter doesn't require the skill needed to catch fish during other times of the year. Just drop your bait in front of the fish, and wait for the fish to take it. You don't need a lot of expensive equipment. A short rod and reel, some hooks and sinkers, wax worms or meal worms, a digging bar or an ice auger, and a large spoon or something you can use to scoop ice chunks that form in the hole you're fishing, are all you need to get started. If you like to fish with lures, you may want to include a few ice flies and small jigs in your tackle box too. Cushing says chartreuse and red tend to be the best colors to use when fishing through the ice. Because you can drill two holes close together, ice fishing is a great way to double your fun by fishing with two poles. Just make sure you have a two-pole permit before you dip your second line in the water. In addition to catching fish, you and those you're fishing with can talk and socialize. Just drill your holes close together, and have fun. "Most ice anglers really look forward to the social side of ice fishing," Cushing says. Sounds great. But isn't it hard to drill a hole through the ice? One thing that surprises many first-time ice anglers is how easy it is to drill a hole through the ice. Cushing says if you have a hand auger, you can drill through six to eight inches of ice in about a minute. "It'll take a little longer if you use a digging bar," he says, "but not much." Digging bars cost between $5 and $10. Manual ice augers cost about $50. Great! But how can I have fun if I'm cold? Temperatures can be cold during the ice-fishing season. But that doesn't mean you have to be cold. You can stay warm simply by dressing for the conditions. Cushing says one piece of equipment anglers often forget is a pair of insulated, waterproof boots. As the day warms, slush can develop on top of the ice. "Having a pair of waterproof boots will keep your feet warm and dry," he says. Sounds good. But how do I know if the ice is safe to walk on? Most anglers wait until the ice is at least 4 inches thick before walking on it. Ice is usually thinnest near the shore. Before you walk out, Cushing says you should dig or drill a test hole to see how thick the ice is. You may also want to dig or drill some additional holes as you walk out. If the ice in your test holes is at least four inches thick, you can be almost certain that the ice farther out is at least four inches thick, or thicker. You can strap the ice cleats to the bottom of your boots. The cleats will give you better traction as you walk on the ice. Ice spikes are two short pieces of metal. They're often attached by a short cord that you can drape over your neck. If you fall through the ice, you can pull yourself out by jabbing the spikes into the top of the ice near the edge of the hole. Once the spikes are jabbed into the ice, use them to pull yourself out of the hole. Part 2 - Equipment you'll need to catch fish through the ice.